and to pray for her well being. It is Shichi Go San. My daughter, wife and I wore kimonos. My mother has a license to teach kimono wearing. She loves to let us wear kimonos. Especially she wants this for my daughter, because I do not have any sisters. So now, Japanese people do not wear kinomos very often. Only a few people do. Most Japanese do not have many chances to wear a kinomo. On new years many Japanese go to a Shinto shrine to pray. 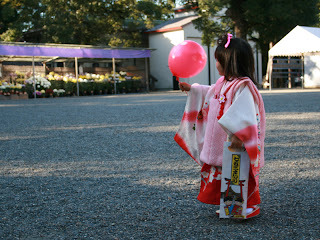 When I was kid, I could see many people wearing kimonos. Now there are not so many. I am lucky my mother wants to let us wear kimonos. My mother-in-law likes to buy kimonos. So I am going to wear a kimono every year. I can feel a graceful traditional with kimono.